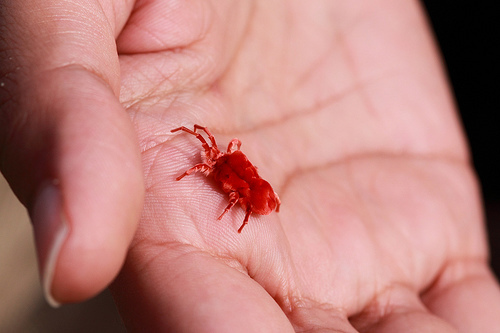 ﻿ Trombidium grandissimum: "Giant Red Velvet Mite"
Trombidium grandissimum "Giant Red Velvet Mite"
Welcome to the fascinating (and not for the faint of heart) world of the Giant Red Velvet Mites. They go by a few different names including the Rain's Insect, and they are also known as Bhir-buti, Birbhoti and Bir Bahoit in Northern and Central India, where T. grandissimum is most commonly found. 1) It is visible with the naked eye. 2) And by visible I mean the "Giant" Red Velvet Mite measures in on average, around half an inch (which is very large for a mite). 3) Its entire body looks like it is covered in red velvet, hence how T. grandissimum got its name. Continue to classification to discover where T. grandissimum fits in with the rest of the world, or visit MultipleOrganisms.net to learn about a multitude of other organisms you may have never heard of! The picture of Trombidium grandissimum in the banner was photographed by Tarique Sani. Feel free to contact me if you have any questions or comments!